For patients who fear a dentist or feel fear of pain in a dental chair, we have a solution – inhalation sedation. It is a treatment with the use of laughing gas. During inhalation sedation the patient is given a special mask through which the laughing gas is feeded. This procedure immediately relaxes the patient, reduces anxiety and introduces him to a state of full relaxation. When using inhalation sedation, the patient is constantly aware. He reacts to all doctor’s orders. 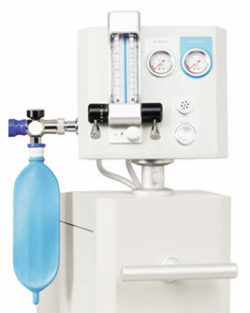 Inhalation sedation involves inhaling a mixture of gases in the right proportions that are safe for the human body. Thanks to its characteristics it reduces the stress accompanying the visit in the dental office and the fear of pain. This procedure does not dull and allows dentist to maintain full contact with the patient. It stops working after just a short moment, so you can drive the car already 20 minutes after the end of the visit. When using inhalation sedation, the patient is constantly aware. He reacts to all the doctor’s orders. In Luxdentic, we use modern advanced Ambulance All 5000C device for sedation treatment. long surgical, prosthetic and maxillary impressions in people with a strong gag reflex.